According to Wikipedia, pozole (more commonly referred to as posole in the United States) is a traditional pre-Columbian soup or stew from Mexico. It used to have ritual significance. Since maize was a sacred plant for the Aztecs and other inhabitants of Mesoamerica, pozole was made to be consumed on special occasions. The conjunction of maize (usually whole hominy kernels) and meat in a single dish is of particular interest to scholars because the ancient Mesoamericans believed the gods made humans out of masa (cornmeal dough). I spotted this recipe in the December 2013 edition of Food & Wine magazine. 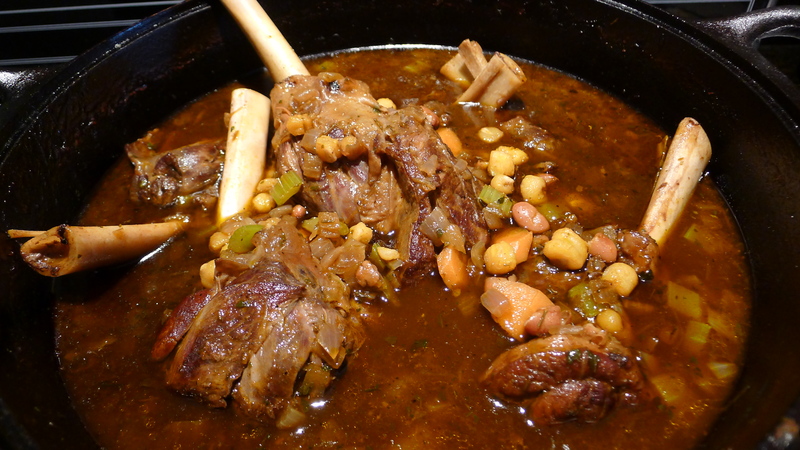 Traditionally posole is made w/ pork, however this recipe called for lamb shanks which appealed to me because I have a freezer full of grass-fed lamb from Missouri. It also sounded like a fantastic cold weather dish. It was so good that most of the friends I had over to partake in eating this posole asked for second helpings! I served the posole w/ sautéed kale and cornmeal bread for soaking up all the goodness. Click here for cornmeal bread recipe. 2) In a large cast iron pot, heat 2 tablespoons of the olive oil. Season the lamb shanks w/ salt and pepper. Place 3 shanks in the pot and cook over moderate heat until browned all over. Transfer to a baking dish. Repeat the procedure w/ the remaining 3 shanks. 3) Add the garlic and half each of the onion, celery and carrots to the pot and cook, stirring occasionally, until golden. Stir in the cinnamon, oregano, 1 teaspoon of the cumin and the chopped chiles. Add the lamb shanks and any juices, then add the chicken broth and bring to a boil. Cover and braise in the oven for 2 hours until the lamb is very tender. 4) In a heatproof bowl, cover the remaining chiles w/ 2 cups boiling water; soak for 30 minutes. 5) Transfer chiles and 1 cup of the liquid to a food processor; puree until smooth. 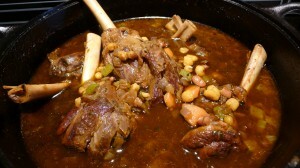 6) Transfer the lamb shanks to the baking dish and loosely tent w/ foil. Strain the broth and discard the solids. 7) Wipe out the pot. Heat 2 tablespoons of olive oil in the pot, add the remaining onion, celery and carrots, then cook over moderate heat, stirring occasionally, until golden. Stir in the chile puree, coriander, hominy, pinto beans and the remaining 1 teaspoon of cumin and cook for 2 minutes. 8) Add the strained broth and simmer for 10 minutes. Stir in the lime juice and season w/ salt and pepper. Add the shanks to the pot and cook until just heated through. 9) Serve the posole in bowls, passing the cilantro, avocado and lime wedges at the table.